convince prospective buyers to stop in. You may think some accounts are just unsellable this time of year. So, you might wonder how a Montana ad rep convinced a hot tub store owner to sign a 13x contract (for 5 col x 18" ads) in the middle of April, getting them to spend more in 3 months than they did throughout the entire previous year. Andrea DeNucci is the ad rep at the Bozeman Daily Chronicle group was able to do it because she proved upfront that running a new ad with a strong strategy would get a dramatic response. 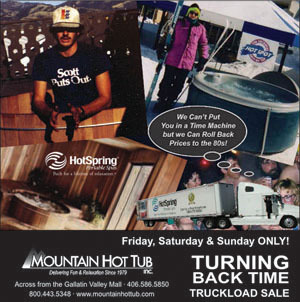 In fact, the business sold more hot tubs off the very first ad than they ever had before, even before the recession. The Bozeman Daily Chronicle just passed the $75,000 in added revenue for a little over a month of using these techniques, and is showing no sign of slowing down. This is especially significant because while conducting my ad sales seminars, ad reps are telling me their most common objection continues to be, "nobody's spending money right now, so I can't advertise (or I need to really cut back)." The reality is that there are plenty of consumers buying, your ad reps just have to convince the prospect that with the right ad strategy, they can get the majority of those consumers into their store. It involves you doing two things. First, you'll need a killer ad strategy. All the case studies in this blog use a process taught in our Response Oriented Selling course that make creating direct-response ads easy. Look through the posts and I bet you'll see a pattern. When it's time to show the ad, you can explain how the new ad fits in with the information about their business, products, and competition while at the same time adhering to the new approach to creating effective ad strategies. believing this will be worthwhile to visit. Once you learn how to do it, it's incredibly simple. After teaching the prospective advertiser the new techniques (which also moved her from the "vendor" mode to the "partner" mode), Andrea got some information and sketched out a rough strategy. It involved featuring a major graphic of hot tubs at the top of the ad to grab the attention of those few people who happen to be obsessed with hot tubs this week, mirroring back what the target customer cared about when buying hot tubs (price, selection, and service), and then getting into enough substance that even the most skeptical prospective buyers-- those planning on going somewhere else--would be sold enough on the shop to go there. I wanted to let you know that I met with the hot tub place today and he said the ad worked great! They were crazy busy that weekend and sold more hot tubs for that sale that weekend than any other sale they have had in the past. And he said that people were saying that they saw the ad in the paper and came in knowing what hot tubs they wanted. So, keep in mind that until you fix the underlying theories the advertiser has on how to get a response, you, your newspaper, and the recession will continue to be the most logical explanation for why newspapers don't work for them. Fix their underlying theories and create a real strategy--don't just hand an old ad off to your designers and say "be creative"--and you'll be amazed how quickly you'll increase your ad sales as well as the sales of your advertisers.